The report segments the coffee beans market based on product, end use, and geography. Based on product, the coffee beans market is categorized into arabica, robusta, and others. By end use, it is classified into food, personal care, and pharmaceuticals. Bakers have been integrating coffee into muffins, cookies, and cakes for years. The different flavors, such as baking with espresso provides a richer, deeper flavor to the recipe than the lighter roasts. These coffee-made cookies and cakes are gaining popularity and hence, supplementing the coffee beans in the food products industry. Geographically, it is analyzed across North America, Europe, Asia-Pacific, and LAMEA. These beans are more resistant to pests and diseases and are widely produced in Vietnam. Robusta is likely to grow at the fastest rate because of its high caffeine content and strong properties as blends. These beans are comparatively small, rounded, and brownish yellow in color. Robusta beans are typically used in instant coffee, espresso, and as a filler in ground coffee blends. 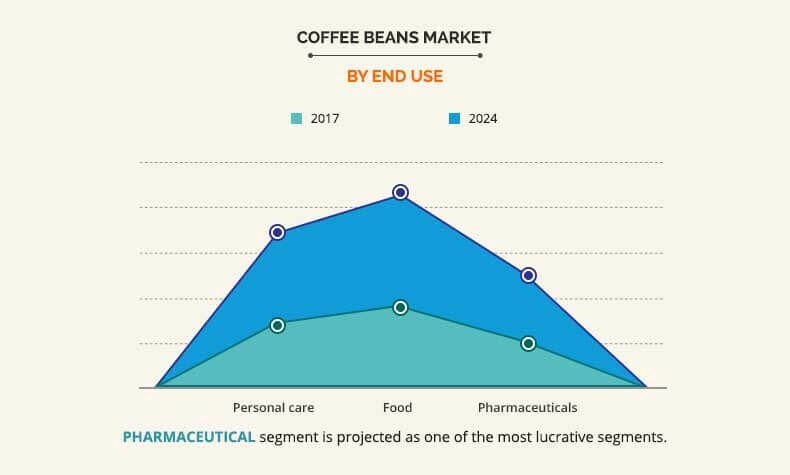 The usage of coffee beans in the pharmaceutical industry is augmenting the global coffee beans market. The health-benefits that are associated with coffee beans in the form of dietary supplements have increased its consumption. The green coffee beans extract has a higher level of chlorogenic acid as compared to other roasted and regular coffee beans, as these beans are not roasted. Thus, the adoption of green coffee beans in the form of weight loss supplements has been widely observed among consumers. The key players operating in the coffee beans industry include Kicking Horse Whole Beans, Death Wish Coffee, La Colombe Corsica Blend, Caribou Coffee, Luigi Lavazza S.P.A., Illycaff S.p.A., Hawaiian Isles Kona Coffee Company, Ltd., La Colombe Torrefaction, INC., Peets Coffee & Tea, Inc., Coffee Beans International, Inc. 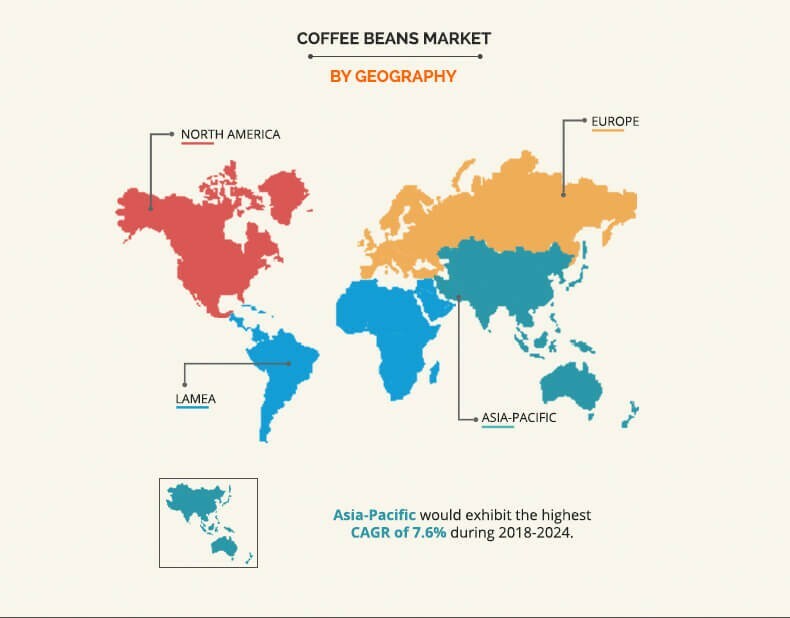 This report provides an extensive analysis of the current trends and emerging estimations in the global coffee beans market. In-depth analysis of the industry is conducted through market estimations of the key segments from 2017 to 2024. Comprehensive analysis of factors that drive and restrain the growth of the global coffee beans industry is provided. The key players are profiled and their strategies are studied to determine the competitive outlook of the market. 7.2. Caribou Coffee Company, Inc.
7.3. Coffee Bean Direct LLC. 7.4. Death Wish Coffee Co.
7.7. La Colombe Torrefaction, Inc.
7.10. The East India Company Limited. The demand for coffee is on the rise across the globe. Still, Europe accounts for around one-third share of the total coffee in the global coffee beans market consumed while China has doubled its coffee consumption in the last 4 years. The demand in Western countries is still quite strong which further pressurizes the coffee-producing nations. The coffee production in nations, such as Brazil, Vietnam, Colombia, Indonesia, and others has witnessed a shift owing to the climatic conditions. The adequate rainfall in Brazil and other favorable weather patterns have fueled the growth of the coffee beans industry. The roasting and brewing of green coffee beans has witnessed an increase over the years, due to the health benefits associated with it. The green coffee bean extraction from the unroasted beans improves glucose, reduces weight, and ensures insulin balance. 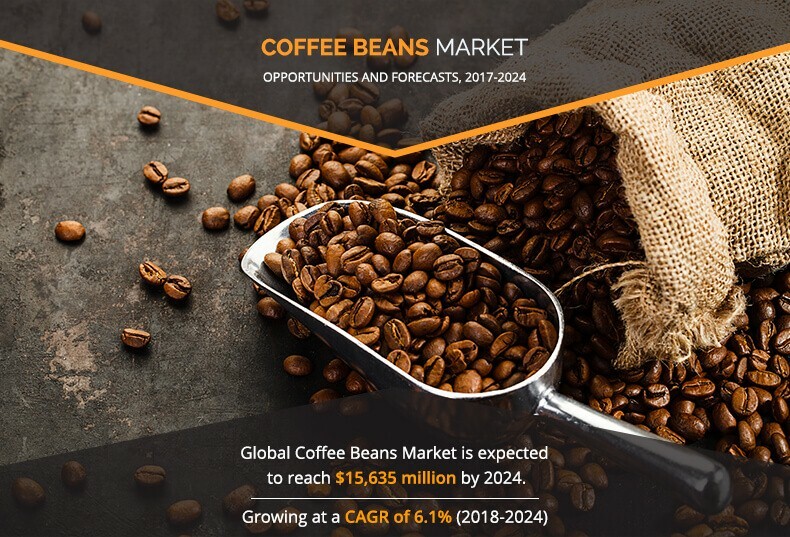 In addition, the growth in popularity of weight loss supplements coupled with the hectic lifestyle are driving the demand for green coffee beans, thereby supplementing the global coffee bean market.